Imola, 10 May 2015 – The Imola Sunday ended for the Aprilia colours with Jordi Torres’ first podium of the season in Superbike Race 2 on a completely new track for him and with Lorenzo Savadori’s decisive affirmation, increasing his hold on the lead in the FIM Superstock 1000 Cup with his Aprilia RSV4 RF. The rider from Cesena won the second race of the season with a gap of more than two seconds ahead of his closest rival. It was a complicated day for Team Aprilia Racing – Red Devils, key players in the World Superbike Championship. 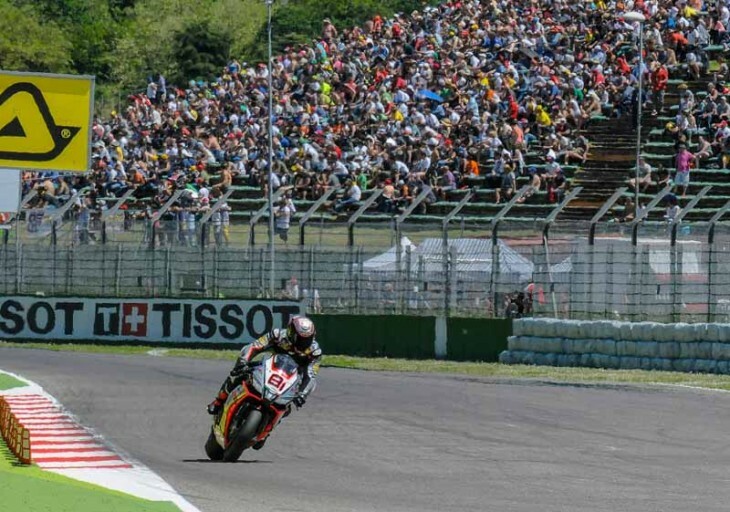 In Race 1 the Leon Haslam got off the line well for the Italian team on his RSV4, then maintaining his pace until the race was red flagged (six laps from the end) with a consequent restart for a shortened distance. In the six laps that decided the finishing order, Leon rode to a fourth place finish which is fundamental in terms of championship points. The English rider was not as fortunate in Race 2 with a highside on Turn 3 during the eighth lap. Haslam was taken to the track Medical Centre where X-rays showed no fractures, but further tests will be needed to rule out any complications. Leon holds onto second place in the overall standings, just a few days from his home race at Donington. Leon Haslam: “A difficult day for me. In Race 1 I brought home the best possible result. In Race 2 I was struggling in the braking section and I even went wide a couple of times, ending up behind VD Mark and Jordi. Then I found a good pace but just as I was making up ground I had a bad highside on turn 3. I’m hurting all over now, but thinking about the crash I think I’m lucky and I should be at 100% by Donington”. Jordi Torres took his first podium in his rookie year in the category, finishing Race 2 in third place after a shrewdly ridden race. The Spanish rookie, forced to withdraw in Race 1 after running straight on, is now lying fifth in the Rider Championship standings and is demonstrating more and more feeling with his RSV4 RF. After a complicated début in Friday’s practice sessions due to difficulties on a new track for him, Jordi improved consistently, arriving at the podium in the end, a result thanks to his efforts and those of his team. Jordi Torres: It’s incredible! After the practice sessions on Friday I thought that this was a difficult track with chicanes that are my weak point and a very narrow track. In Race 1 I had a few problems with the gearbox. I was struggling in downshifting and in the end I had to withdraw after running straight on. The guys did a great job fixing my bike for Race 2 and this third place goes to them. I have definitely changed my opinion on this track. Now I think it is the best one in the world! Seriously though, I’m very pleased with the improvements we made. On a new track we did a great job. I think that on tracks we know we’ll be able to confirm our progress.